The classic dinner party compliment ‘you cook so well, you should open a restaurant’ couldn’t be less true. Food is important but we all know it’s not the only thing that matters in a restaurant. You can feel the passion that chef, owner and Italophile Lana Oliveiro exudes as she explains her menu, which changes daily according to what fresh ingredients are flown in from Italy. But having just moved from a single-table private kitchen to a 20-odd-seater restaurant, the kitchen has yet to find its pace. The starters are a prime showcase of the jet-fresh ingredients. Just thinking about the coppa in the plate of cold cuts ($168) has us drooling and the bed of cavolo nero the baby artichoke sits on ($128) is a crunchy delight. The solitary zucchini blossom fritter ($118), however, is weighed down by a thin but dense batter and, despite a homemade passata, the flavours are unexciting. Uno Duo Trio is known for the handmade pastas and, although both dry and fresh are on the menu, the dishes seem to be designed with fresh in mind. With the Sicilian red prawns ($248), choosing dry gets you spaghetti, whereas the fresh option is mandilli di seta, large ‘handkerchiefs’ of pasta which would do much better at lapping up the rich sauce. Neither pasta will change the limp texture of the prawns, however. The fresh papparadelle al ragu ($208) is a thoroughly satisfying dish, brought down-to-Earth by the lentils and given a spark by the herbs and spices of the pork sausage. If only we didn’t have to wait so long for them to arrive on our visit. 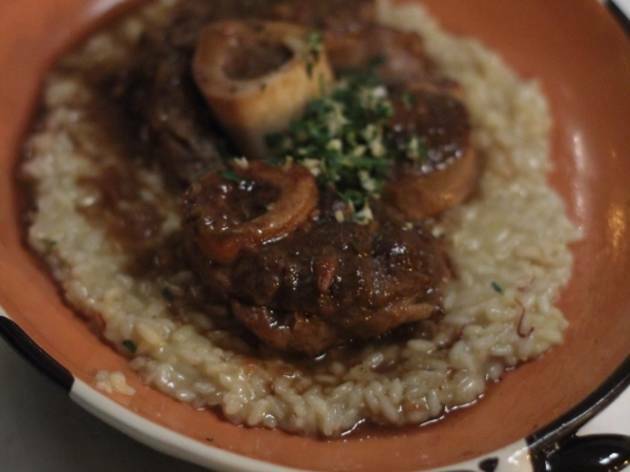 The main courses are generous – so what appear to be high prices are justified. 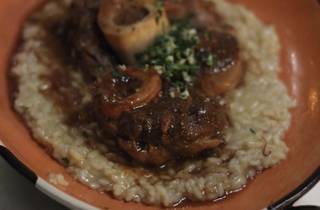 The osso bucco ($398) comes with textbook-perfect risotto and melting bone marrow which could easily satisfy two to three as a main course. The cesto di frutta ($68) is a crisp and slightly chewy meringue topped with a cap of cream and fresh strawberries. It’s simple, but thoroughly well executed. 19/F Bartlock Ctr, 3 Yiu Wa St, Causeway Bay, 3489 3862. Tue-Sun noon-2.30pm & 6pm-11.30pm. Cash only. Dinner for two: around $1,000.